You are here: Home » » For the Seller » Why Is My House Not Selling? How long does it take to sell a house? Some people seem to be selling right away, while others stay on the market for a long time. Is this just the market, or is there a reason as to why your house is not selling. My impression is that the real estate market is good right now. When I speak to others in the industry, they often make similar statements. If you hear the news, you can find stories of an improving housing market. The real estate industry is upbeat. That is great, but does this translate to good news for sellers? Over the last year, I have seen more homes in my own neighborhood become rental properties. This is not always a good sign. There are several factors which induce owners to become landlords, so this might not be a standard to observe. I began paying attention to homes in neighborhoods that I frequent, and I felt that there was one trend that I spotted which could explain why a home is not selling: neglect. You want to sell your home, but you have already moved to your new home. You have your home listed with a real estate agency. Sometimes you think there is good interest in your home, since the agent has told you that people are coming to see the home. No one is making an offer though. Months begin to pass, and you are wondering why no offers are coming. You may need to understand a few things. When your home is first listed, agents looking for a home for their clients in a particular area will go to see the home with their clients. This may not mean that they were seriously interested. They wanted to know what was on offer. This flow may die out, once they know about your home. There may be so many houses available, that your home does not stand out. In fact, real estate associations keep track of how long it would take to several everything on the market. This number will be over six months. Sure, a neighbor managed to sell their home in a month, but that does not mean you will. What is happening to your house while it is sitting there vacant? That may play a factor if your home will sell. This is where the neglect trend may be a factor. I am watching one house where the owner did not spend anytime making repairs before the house went onto market. He quickly realized that he was not going to obtain his asking price, so he decided to go the rental route. This decision may have come quickly for him, since he already owned rental properties. The house went vacant again, but I noticed that this owner has taken a different tack this time. For the last month, the home has undergone a major remodel. I believe that he is preparing to sell. A client of mine this past weekend mentioned that he wanted the house perfect before he moved. He was concerned about the nail holes that the artwork would leave behind when the seller left. As a seller, you may find this to be unreasonable, but buyers do want a sort of perfect house. This leads me to the vacant home. Most vacant houses suffer from neglect in one form or another. I buyer may forgive seeing a small pile of fliers at the door, but other signs of neglect are harder to ignore. The photograph is from a front yard of a home for sale. The yard looked worse at one point. There is a home around the corner from this house that had the same problem, but now a yard crew arrives on a regular basis. I have noticed buyers checking out this house. 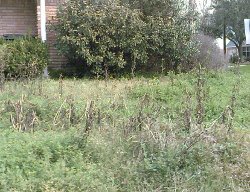 The overgrown yard has kept buyers away from the home in the photograph, until recently. The funny thing to me comes in two parts. The owner came to this home, and the yard did not bother him. Picking up the mail and fliers was his only concern. There are neighbors with houses that look like junkyards, so maybe that is why he has a lack of concern. (Yes, there are some pretty bad looking homes directly near this house in what is a nice neighborhood with some gorgeous homes). His home has been on the market for around a year now. The second funny thing to me was that some buyers did come to the house. I was near, and the woman was speaking loudly into her cell phone: “We can get this house for cheap I’m sure. They (the sellers) don’t care none for the house.” Finally, the seller is attracting interest, but maybe not for the reason that he wants. What can you do to help sell your home? Home staging is always a great idea. A home that looks nice will attract more attention. Yards do not need to look like the Yard of the month, but they should look maintained. I would also suggest fixing obvious problems. If you have a lot of broken tile, that leaves an impression. Buyers may not be checking out a house like a home inspector does, but they are looking. Vacant homes can begin to smell if the air conditioning has not been running. Basic cleaning is the answer, along with basic yard maintenance. When the housing crash hit full stride in 2008, you could tell the foreclosures from the homes for sale by the owners. Foreclosures looked neglected. That is not the case anymore. Many lenders learned that if they want to obtain their money back, they needed to send in a crew to make the home look presentable, and keep it looking good. Currently, there are sellers that could learn this lesson. This entry was posted on Friday, February 24th, 2012 at 2:24 pm	and is filed under For the Seller. You can follow any responses to this entry through the RSS 2.0 feed.